Emissions from fossil fuel combustion are the primary driver of the increase of atmospheric CO2 concentration, and cities contribute about 70% of global emissions within a small fraction of the total land area on earth. 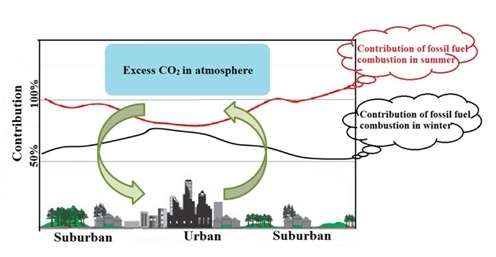 Therefore, understanding characteristics of CO2 emission in urban areas is critical for regulating CO2 emissions and illustrating urban carbon cycles. Recently, a research group led by Prof. ZHOU Weijian at the Institute of Earth Environment, Chinese Academy of Sciences conducted a study to illustrate the temporal and spatial variations of CO2 emissions and recognize their sources and sinks in urban carbon cycles. Based on the measurements of atmospheric △14CO2 and δ13CO2 in Xi’an city, the researchers found that in the winter season, emissions from fossil fuel derived CO2 (CO2ff) contributed 61.8±10.6% and 57.4±9.7% of the excess CO2 (CO2ex) in urban and suburban areas respectively. Combining with the result of δ13C value of different fossil fuels, which suggested coal burning was the dominant source of fossil fuel emissions in winter. In contrast, the proportions of CO2ff in CO2ex varied more widely in the summer season and sometimes even over 100%, with the average contributions of 82.5 ± 23.8% and 90.0 ± 24.8%. The study suggested that reducing the share of coal consumption was still an important way to mitigate urban atmospheric CO2 emissions in Xi’an. Meanwhile, given that biogenic emissions accounted for nearly 40% of the urban atmospheric CO2 emissions in the winter and played a significant role in urban carbon cycles in the summer, so the influence of biogenic activities on urban carbon cycles should be taken into account when making mitigation policy and verifying emissions. The study had been published in Science of the Total Environment. This work was jointly supported by National Natural Science Foundation of China, Chinese Academy of Sciences and Ministry of Environmental Protection of People’s Republic of China.